Washington is actively trying to take advantage of the transportation deadlock that Tajikistan and Kyrgyzstan found themselves in after the Soviet Union’s collapse to advance its regional New Silk Road program. It is obvious that the project’s main goal is to strengthen the US position in the region at Russia’s expense. Two new railway projects have been under discussion recently: Tajikistan-Afghanistan-Turkmenistan and Uzbekistan-Kyrgyzstan-China-Afghanistan-Iran. According to their developers, they should enable Tajikistan and Kyrgyzstan to send their goods west over the so-called southern route. It is noteworthy that the two railway lines will be built to the narrow-gauge European standard. Kazakhstan and Iran intend to join these projects in the future. The approval process for these projects began almost simultaneously in Ashgabat and Bishkek. Working groups from the participating countries met last week in both capitals. Each is pursuing its own goal. However, Tajikistan, which has constantly had problems with shipping, is more interested in building an alternate rail line than the others are. The reason is that after the Soviet Union collapsed Tajikistan was left with only one railroad linking the Republic with the post-Soviet space through Uzbekistan. The line periodically shuts down due to tense relations between the two countries’ leaders, Islam Karimov and Emomali Rahmon. Tajikistan has lost money because of shipping delays, and it has occasionally found itself on the brink of a food and energy crisis. Dushanbe has repeatedly said that new rail lines not dependent on Uzbekistan are needed, but it has not built a single railroad in its 22 years of independence. Dushanbe had an opportunity to join the international China-Afghanistan-Iran railway project. Local authorities had hoped that it would go through Tajikistan and commissioned the Iranian company Metro to do a feasibility study for its section of the line. The Iranian engineers designed a rail line 392 kilometers long with tunnels and 47 bridges. It was reported in early February, however, that Kyrgyzstan and Uzbekistan had joined the project and Tajikistan had been dropped because it would be cheaper to build the railway through Uzbekistan, which has a smoother terrain and an extensive rail infrastructure. China is funding the project, and it finds Uzbekistan more interesting from an economic standpoint than Tajikistan. Therefore, Dushanbe was left with no other choice but to do everything it can to promote the Tajikistan-Afghanistan-Turkmenistan project. Ashgabat and Kabul have been discussing plans to build a railroad from Turkmenistan to Afghanistan since 2011, and in order to connect to that line Dushanbe would need only to add some 50 kilometers on its territory. Moreover, funding for the entire Tajikistan-Afghanistan-Turkmenistan project has been included in the action plan of the Central Asia Regional Economic Cooperation (CAREC), which is funded by international financial institutions. The project is estimated to cost $400 million. After brief consultations, the presidents of the three countries — Emomali Rahmon of Tajikistan, Hamid Karzai of Afghanistan and Gurbanguly Berdimuhamedov of Turkmenistan — met in Ashgabat to celebrate Nowruz and signed a joint memorandum of understanding on construction of the Tajikistan-Afghanistan-Turkmenistan railway. Planning calls for the new rail line to open by 2015. However, the first disagreements arose concerning the choice of route. Kabul is insisting that the rail line run towards the center of the country from southern Tajikistan to northern Afghanistan via Kunduz, Baghlan and Sanagan. The Afghan sponsors want the rail line to run west from there to the Turkmenistan border. Dushanbe fears that the situation in northern Afghanistan along the border with Tajikistan will be difficult for a long time to come because Taliban militias have recently become more active there, and fighting breaks out periodically. Given that, Dushanbe proposes running the line directly from Tajikistan to Afghanistan’s Balkh Province. If that is done, the railway would reach Turkmenistan’s border almost directly. Tajikistan believes this option would be cheaper and quicker. As far as the section of the route in Tajikistan is concerned, the proposal is to route it through Jaloliddini Rumi to Nizhny Panj, which is on the border with Afghanistan. Many experts are suspicious about the idea of building a railroad southward from Tajikistan. According to Azhdar Kurtov, an expert at the Russian Strategic Studies Institute, “In the first place, this railway will not get Dushanbe out of its transportation impasse — no railroad is going to change its geography. Tajikistan is a mountainous country. Running lines of communication through mountainous terrain, especially railroads, is a very expensive proposition — costs at least double for any construction in mountains. Second, it is very difficult to lay track bed designed to carry heavy freight trains in mountains. Third, mountainous terrain is not conducive to building sidings. 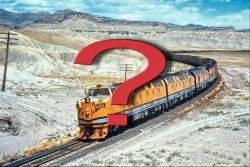 That means the rail line could not be used intensively.” Therefore, the project is nothing more than a strong desire to show that Tajikistan is seeking and supposedly has found a way out of its transportation impasse and an option for diversifying its POL imports. It is possible that the project is fated to go the way of many others that were in the works and under discussion but ultimately remained on paper. Especially since this is an election year for Tajikistan, and the recent memorandum signing resembles another PR stunt by President Rahmon. In addition, Afghanistan is unlikely to become a safe country in the near future, and considering the varied ethnic makeup of the inhabitants of the northern provinces, who have not always gotten along, the risks to transit through its territory will remain high for a long time to come. However, the Tajikistan-Afghanistan-Turkmenistan project is clearly part of Washington’s global New Silk Road Project developed for Kabul. The quarterly report to the US Congress by the Special Inspector General for Afghanistan Reconstruction (SIGAR) released in March says that the northern rail route in Afghanistan will give Uzbekistan, Tajikistan and Turkmenistan access to world markets through the Iranian port of Bandar Abbas, and it will also establish a new rail corridor for the Central Asian states free of Russian influence and, in addition, will give them access to world markets that they have lacked. Tajikistan is becoming the object of a geopolitical game in which a railroad will be a trump card in Washington’s game with Russia. In Central Asia, therefore, the United States is attempting to bring two integrated projects — America’s New Silk Road and Russia’s Eurasian Union — into conflict. And the second railway project, which Beijing is lobbying for (Uzbekistan-Kyrgyzstan-China at a total cost of $2 billion), would primarily benefit China. The experts say it would give China a railroad for Kyrgyz exports of silver, aluminum, copper and coal. Alexander Sobyanin, chief of the planning service of the Cross-Border Cooperation Association, believes that Beijing is providing for its security on the west. On April 19, however, Kyrgyz Prime Minister Jantoro Satybaldiyev rejected such “expert speculation” on live television, saying that the government is not considering giving China the Sandyk aluminum minefields in Naryn Province. The railroad gauge standard chosen for the railway has been a key question for a long time. China originally insisted on and managed to get the European gauge — 1435 mm — for the railway, whereas the Russian standard, which is common to all of the post-Soviet states as well as Slovakia, Finland and part of Afghanistan and Iran, is 1520 mm. “Bishkek’s fussing can cause irreparable damage to Russian security, and not just to Russian interests in Central Asia. A track gauge of 1435 mm would make things dramatically worse for national security in Siberia, the Volga River basin and in the Urals,” Sobyanin believes. “If the Chinese gauge prevails, it would automatically benefit China’s security and the Chinese military. It is not a question of Kyrgyz-Russian relations, it is a question of the future of Russia itself.” This factor is also very important because in the future the railroad would become part of European rail projects from China to Europe through Iran and Turkey, bypassing Russia. It would dramatically increase the amount of Chinese goods on the European market with all of the sociopolitical consequences that entails for Europe. Viktoria Panfilova is a political columnist for Nezavisimaya Gazeta. This article was written expressly for New Eastern Outlook.